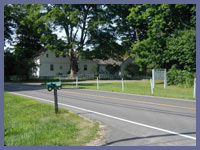 Flanders Nature Center Woodbury, CT.
Main Attractions: Great educational facilities for children, scenic trails, open fields, farmland, diverse ecosystem, large ponds, theme trails. 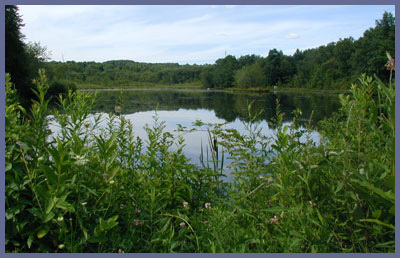 Flanders Nature Center in Woodbury, CT. offers a wide variety of trails that visually stimulate and educate. All of the trails have a theme such as "Botany", "Geology", etc. If you've ever wondered the names of certain trees, flowers, or bushes, you'll find some answers here. As you stroll through woods, open fields, around ponds, and over streams, you can stop and read about the ecosystem. The trail system is well maintained and easy to follow. Individual trails are color coded and you can combine numerous trails to venture off on long hikes, or just hop out of the car for some fresh air and a short walk. The terrain is mostly flat and there or no overlooks or observation towers at Flander's. Located in the middle of all the trails is an information center. It's a great resource for all kinds of information including upcoming events sponsored by Flander's such as an Amateur Astronomy Night or children's activities. The Center's programs are posted on the information center or back near the entrance to Flander's. You can also visit their web site for updates and to see what's going on the day you plan to visit. http://www.flandersnaturecenter.org Flander's Nature Center is a wonderful place to bring children and introduce them nature or you can just venture off on a nice peaceful hike if you're going solo. If you visit during foliage season it's a perfect place to get up close to the rainbow of colors the leaves present each year (bring your camera or easel as there are some great photo ops here!). Flander's Nature Center is a perfect destination for those who like to go for a ride and take in some fresh air. The road leading to Flander's will take you passed some great rural towns and farmland. Directions: From Interstate 84, take exit 16 (Southbury exit) and head north on Route 6. Go through Southbury and the town of Woodbury. This is about 7 or 8 miles total. As you leave the center of Woodbury, there will be a volunteer fire department building set back a bit from Rt. 6. One tenth of a mile later is Flander's Road. It's a left-handed turn; the main road bears sharply to the right. Go up Flander's Road 4 miles and take a right where the sign indicates Flander's Nature Center. There is a small dirt parking lot on the right and an Art Guild building on the left. Go pass these, as they are not the main center for hiking/outdoor activities. Two-tenths of a mile later on the left is the Center and on the right is parking. Use the Center to locate a hike of interest. Their phone number is 203-263-3711.